TONY Clubb has eyes on cementing a regular spot in the Wigan front-row this year. The ex-London Broncos captain can also play second-row and loose-forward – and even starred as a centre for England in 2010 – but has told Shaun Wane he wants to shake the utility tag and make the prop position his home for the rest of his career. Clubb figured 23 times for the Warriors last term, 14 from the bench including the surge to the Grand Final, when he was used to good effect as an interchange prop. “I’m happy at prop, really happy, really settled there,” said the 27-year-old. “I’ve told Waney I’d like to play there if I can. “I didn’t really enjoy back-row – and don’t get me started on playing centre! “I got some good runs at prop last season, and hopefully I’ll get another good run this year. 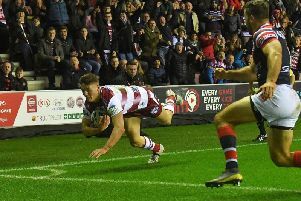 The front-row is the most congested position at Wigan and – with Ben Flower suspended – Clubb may get a chance to press his claims for a starting role in Sunday’s pre-season friendly at Leigh. Dom Crosby finished last season in good form, while academy-graduates James Greenwood and Ryan Sutton are also in the frame. Clubb (pictured below) arrived with Dan Sarginson from London ahead of last season and, more than 12 months on, he now feels much more comfortable. “It was a pretty good year for me, I played a good few games, and coming back into pre-season I felt more comfortable in terms of knowing everyone and how things work here.